The official blog of PATCHTRENDS.COM. Patchbazaar.com now has custom search RSS feeds (with filter options) and link generators for those and permanent links to the search page, with the latest results. How Does One Use the RSS Feed? book mark the RSS, now you're done! Feel free to contact me with questions and comments. Patchbazaar.com is a Boy Scout Patch Super Store, and is made up of items from a growing list of trusted sellers who have eBay stores. Our goal is to be the go-to place for finding the items that your heart is desiring. It is a sister site of Patchtrends.com and Patchlodge.com. I implemented the same style of search filtering and ordering at Patchbazaar.com as I did at its sister site, Patchtrends.com. The URL in the address par is also book-markable (that is, you can copy and paste it and share it with others). In the near future, I'll be implementing RSS feeds, book mark generation, and more advanced search and filtering. If you are an eBay store and wish to submit your store for consideration, please email patchtrends@gmail.com and let us know. At this point there are no firm criteria other than your reputation and references check out. As an introductory offer, we were providing the Boy Scout Prices Realized - The Complete Collection as a free gift. Today we have discontinued the gift. For those who have joined through yesterday, we will honor the gift. We have no plans to offer a free gift any time soon, but that's not to say we never will. If you missed out on the free gift, you can still purchase it on eBay for a reduced price of $20. 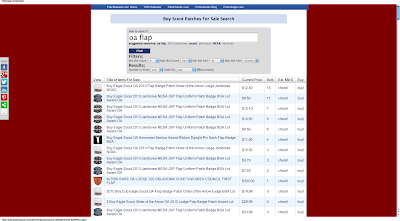 Please check out the Free Boy Scout Patch Online Price Guide and the new Boy Scout Patch Super Store for buying Boy Scout patches from our network of trusted sellers. Please consider signing up for a Patchtrends.com membership. It gives you access to our great site as well as access to a growing family of related sites. Due to popular demand, I have been working on a site that focuses entirely on active auctions and items for sale. For right now, it's listing items from just a few reputable sellers. I plan on expanding the selections with your help - so please suggest some other sellers to follow. I will check them out and add them to the site if they are deemed to be highly trusted and have a nice selection of items. Furthermore, this site will be open for all. I don't plan on member access at this time, but I may expand it to offer special active-auction services for members of Patchtrends.com. All search options will be available for free, but member access would be required for things like alerts and saved searches. I'd also like to integrate it with the sales data available at Patchtrends. I would also like to integrate a lot of nice features for free, as well. In the meantime, enjoy Patchtrend and Patchlodge's new sister site - Patchbazaar.com! Question: Who are some of the best and most reputable BSA memorabilia stores on eBay? You may answer in the blog comments, Facebook comments, or message me privately (anyway you know how). BSATOR.com is a new site with the latest TOR information, and Patchtrends.com highly recommends it. We are partnering with BSATOR.com, and we will soon be offering related and free services for TOR organizers and participants. Stay tuned! With a goal of spreading awareness of our Free Search option, we have a modest goal of reaching 1000 likes ASAP. Please share this with your friends and fellow patch trading mates. We began collecting data, and as of yesterday we reached a major milestone. We have witnessed our 750,000th closing auction, and we have no signs of slowing down yet. We had a large up swing in auctions after the end of the 2013 National Boy Scout Jamboree, which puts us right on track for reaching over 1,000,000 closed auctions by the end of the year. All of this data is available to members of Patchtrends.com. Join today!